Most people aged in their fifties opt for a term life policy that provides between 10-20 years’ coverage. This will secure them until they have paid down on a mortgage and their kids have graduated and are self sufficient. Those above 50 years old are contributing more to their IRA or 401k than previously, so up to retirement age, life insurance mainly serves the purpose of replacing loss of income. In this instance, term life insurance works best as it is more affordable than whole life and allows you to specify the length of coverage. As you can see, a 50 year old man who has no history of tobacco use and has a clean bill of health will pay a significantly higher premium than if he opts for term life. If used properly whole life insurance can be a valuable asset, but it is well worth considering the benefits before buying into a policy as it comes at between five and ten times the price. Be wary of pushy agents who are forcing the benefits of a whole life policy upon you. Often policyholders let their chosen plan lapse after they find they no longer need its protection, so in hindsight a term life policy would have been more beneficial and cheaper into the bargain. Before deciding upon a term for an insurance policy, 50 year old enrollees should consider the benefits of each term. Most applicants in this age group settle for between 10 and 20 years’ coverage. A reputable agent will always ask details as per your assets, such as any investments that you may have and the value of your property, retirement contributions and any outstanding debts. They should then advise as to how your policy will fit with your whole financial life-plan. Is 50 Years Old Too Late to Apply? 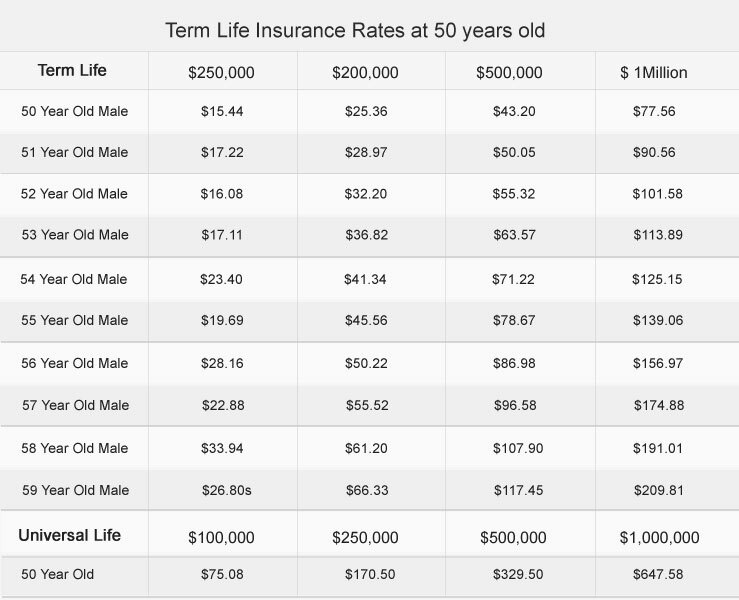 Most people aged 50 years old and above are purchasing term life insurance as a means of subsidizing lost income. Those lucky enough to be affluent in their old age often use a term life policy when planning their estate. This however is a dubious choice and in most cases a guaranteed universal life insurance plan or survivorship life policy is more suited to your requirements. Those seeking term life insurance at 50 years old and above are advised to seek as many rates as possible to ensure they are getting the best deal. Competition within the market is considerable and you will often get more for your money. Choose a licensed, accredited agent that knows your locale and will find you the optimum deal for your money. This particularly applies to those who have had a policy rejected or suffer from a pre-existing condition. It is essential that beneficiaries are selected carefully particularly if they are minors. In this instance policyholders must review their policy regularly to ensure their decision still stands. There are several occasions where beneficiaries an change, such as after a change in marital status or when a child reaches a certain age. 50 years old may seem a little late to apply for a term life insurance policy, but it’s actually commonplace. Often those who applied for term life insurance in their 30’s and 40’s need to renew their plan, particularly if they haven’t paid off their mortgage of were late having kids. The simple fact is that whatever your situation, you’re better off covered and the sooner you secure your future the sooner you can get on and enjoy life.